Regularly marketed as Cambridgeshire's shopping capital, the city of Peterborough certainly has more to offer than its plentiful shops and Queensgate, Rivergate and Serpentine Green malls. Amidst these modern complexes tourists will find some attractive historical buildings and charm, with the Norman architecture of Peterborough Cathedral adding a handsome backdrop to the city centre. 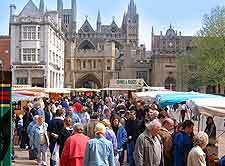 The Cathedral Precinct is where much of the tourism and attractions reside in central Peterborough, with the city's Tourist Information Centre (TIC) being based is this area, near to Cowgate and Bridge Street. By day there are stately homes, waterways, museums and surrounding countryside parks to explore, while by night, the city takes on an altogether different character, offering an enticing nightlife, with bars, theatres and even greyhound racing. 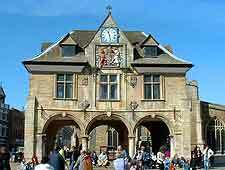 Apart from the shopping centres, visitors also come to Peterborough to learn more about the city itself. Guided walking tours are an excellent way to find out more about the available tourist attractions and include various tailored packages, suitable for children and historians alike. Afternoon cruises along the River Nene are also popular, as are trips onboard the restored steam trains at the Nene Valley Railway. If you crave a little green space, then Peterborough certainly provides on that level, with its recently completed award-winning Millennium Green Wheel project featuring miles of pathways, cycle trails and parks. In central Peterborough, Nene Park is home to the Ferry Meadows water sports centre, where you can hire boats or have a go at windsurfing. On the northerly side of Peterborough, Central Park is also highly suitable for families and has play areas, miniature golf, tennis courts and tea rooms. More information about Peterborough Tourist Attractions. 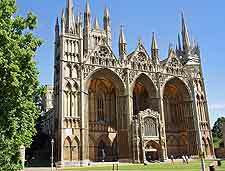 For many, the Cathedral Church of Saint Peter, Saint Paul and Saint Andrew is simply known as Peterborough Cathedral and is often the first port of call for tourists. The fan vaulted ceilings, intricate stone carvings and majestic facade really do provide a calming influence to this busy part of the city centre. Nearby, the Town Hall and the Guildhall (Butter Cross) are further architectural triumphs, along with the Art Deco Lido outdoor swimming pool, the Longthorpe Tower and Thorpe Hall. 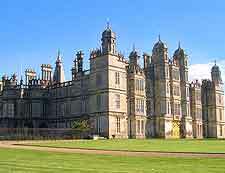 Just outside of Peterborough is Burghley House, which is located at Stamford and is reputedly the biggest of all the country's Elizabethan houses, and certainly the grandest. For soccer fans, the sheer sight of London Road Stadium (The Posh) is likely to impress and many important games have been played here over the years. 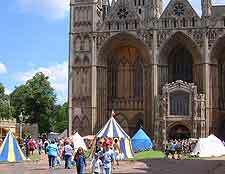 More information about Peterborough Landmarks and Monuments. Information about the city's heritage is in abundance within the Peterborough Museum and Art Gallery at Priestgate, where local treasures range from Iron Age and Roman artefacts, to fossils and sculptures. The museum is even said to have its very own resident ghosts, although they only tend to make an appearance after hours. Continuing the history theme, the Flag Fen (Britain's Bronze Age Centre and Archaeology Park) was unearthed as recently as 1982 and links the city with Whittlesey Island. At the Flag Fen, tourists will find a fascinating replica of an authentic thatched Iron Age roundhouse. Also in Peterborough is the Railworld Museum on Oundle Road, which has an admirable sustainability theme, investigating the ways that future rail transport and subsequent pollution can be improved. More information about Peterborough Museums and Art Galleries. Cambridgeshire contains many wonderful tourist attractions outside of Peterborough, and fortunately the city is well placed for a variety of day trips. Many visitors choose to take an excursion to the city of Cambridge, where you can marvel at the historic university buildings before punting along the River Cam. There are also several surrounding animal centres and farms, such as the Butterfly and Wildlife Park at Spalding. Bourne, Elton, Market Harborough, Nassington and Wisbech are all known for their grand stately homes and are within easy reach of Peterborough. King's Lynn, Leicester and Northampton are but an hour away and each come with their own set of sights. 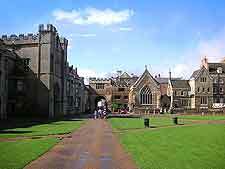 If you are happy to travel just that little bit further, then the possibilities open up and include the cities of Coventry, Derby, http://www.world-guides.com/europe/england/lincolnshire/lincoln/ and Nottingham, as well as the seaside resort of Skegness. By train, tourist destinations such as London, Norwich and York become all the more accessible and tempting. 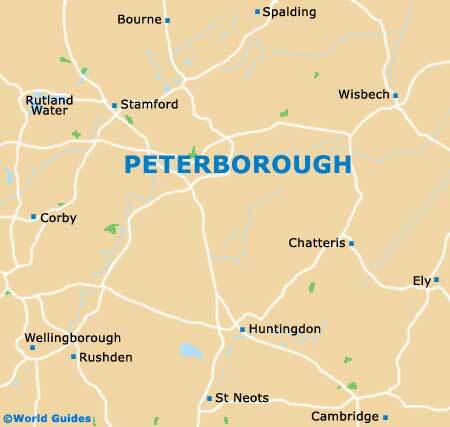 More information about Peterborough Attractions Nearby.